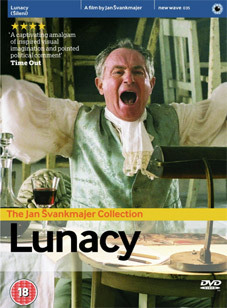 New Wave Films in association with Illuminations Films and Athanor are pleased to announce that three feature films by the celebrated Czech film-maker Jan Švankmajer are being released on DVD for the first time in the UK on editions produced by Athanor, the original producer of all three films. These three films, which were originally co-produced and released theatrically in association with Keith Griffiths and Simon Field of Illuminations Films, are (together with Little Otik) Švankmajer's most recent feature films. They all combine live action with animation, and share a common surrealist aesthetic, enormous visual invention, mordant black humour and a fascination with Freud, Poe, de Sade and Sacher-Masoch. All three DVDs will be released on UK DVD by New Wave Films in association with Illuminations Films and Athanor at the RRP of £15.99 each. Surviving Life will be released on 11th June, while Conspirators of Pleasure and Lunacy will be released two weeks later on 25th June. All have have extras including photo galleries. Lunacy has a 'Making Of' documentary and Surviving Life has three background documentaries, an alternative ending and 2 trailers. All three releases have subtitles in English, French, German and Spanish.